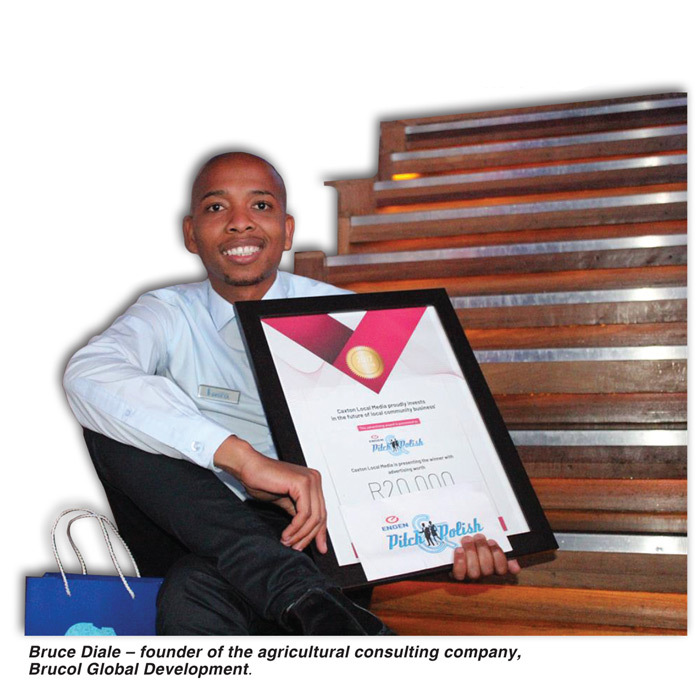 Growing up in an agriculture-oriented family in a rural area of Limpopo, Bruce Diale has always had a passion for agriculture and a strong desire to make a difference in the world. After school, he completed a BSc in agriculture and worked for the Department of Agriculture for several months before hitting out on his own. Diale founded Brucol Global Development, an agricultural consulting company that creates innovative agricultural solutions to help develop rural communities across Africa. The company offers farmer support services, food security services and farm infrastructure development. Diale believes that what sets his business apart from others is innovation. ‘We try to innovate in everything we do. Our systems and products are innovative and so is the infrastructure we’ve designed,’ he says. In 2017, Diale discovered the ENGEN Pitch & Polish pitching workshop and competition online and decided to enter. The Pitch & Polish programme was created by Raizcorp CEO, Allon Raiz, in 2009. Raizcorp is deeply involved in supporting entrepreneurs and believes that entrepreneurs struggle to raise finance, not because their ideas are flawed, but because they don’t know how to pitch their businesses or ideas effectively. Pitch & Polish was created to address this crucial element in an entrepreneur’s journey. To date, the workshop and competition has helped polish over 10 000 hopeful entrepreneurs’ pitches. Using what he learned during the ENGEN Pitch & Polish workshops, Diale has honed and crafted the perfect pitch for his business. ‘I have used the same pitch to government ministers and mayors and it works all the time,’ says Diale. He also credits the programme with teaching him more about finances and giving the business more stability. Since Diale won the 2017 ENGEN Pitch & Polish, Brucol’s turnover has tripled! If you would like to enter to take part in the 2018 ENGEN Pitch & Polish workshops and competition, please visit www.pitchandpolish.com for more information. In addition, Raizcorp is partnering with a global agricultural giant to offer seed packagers and distributors the opportunity to join a sponsored business growth programme. The programme will provide entrepreneurial training and guidance, as well as assistance with agricultural best practices, with a view towards making the participating businesses part of a corporate supply chain. As part of this partnership, Raizcorp is also powering an outreach programme called REAP in Ventersdorp in the North West and Maclear in the Eastern Cape. REAP is a business growth programme for aspiring entrepreneurs in outlying areas and is looking for businesses in the following areas: water and sanitation; the health sector; the agricultural sector; agri-processing; and transportation and logistics. If you are interested in applying to join any of these programmes, please SMS ‘Pula’ to 44332. Article submitted by Penny du Plessis, Communications Officer at Raizcorp. For more information, send an email to pennyd@raizcorp.com.